According to a recent study, by the Content Marketing Institue and Marketing Profs 64% of marketers believe that producing enough content was their number-one challenge. So does this mean it’s a volume game? As marketers, we realize it’s ‘publish or perish’ when it comes to plotting out a successful Internet marketing strategy. And as companies ramp up their content marketing efforts, it’s tempting to buy in to the belief that ‘more’ is better. My competition is posting on their blog 3 days a week? Fine, I’ll do 5. They share 10 tweets a day? I’ll do 20. And while I’m excited to see that marketers are getting onboard with the concept, I fear they may actually be doing more harm than good. The goal of successful internet marketing is to create engaging content that is relevant and valuable to your target market. Don’t get me wrong. This is a huge step forward from where we were 12-18 months ago. Marketing departments are taking their first steps to understand and master this media channel. And, yes, Google does seem to take into account recency & frequency when determining which page to return for a given search query. But the Google Search Algorithm uses over 200 ‘signals’ — all designed to assess QUALITY and RELEVANCE. Inundating the blogosphere with sub-par content will not help you move the needle. And I couldn’t agree more. These represent more than temporary shifts in behavior. They’re the foundation for a successful interent marketing strategy. In my mind, you could really group all of these as ‘quality’ criteria. Quality content adds insight and provides information. Quality content is well written. It has a voice and a personality which people want to engage with. Quality content is ‘shareable’ — in that readers are dying to be the first one to share the post as it associates them with being as cool as the source material. Quality content begs transposition to other media like infographics, Slideshare presentations, Camtasia-style screen presentation and video. After all, a picture is worth thousand words. Blogging for blogging’s sake is a mistake. We need to focus on creating content that is rich in substance and valuable to our target market. Bury your site within a sea of white noise because you’ve done nothing to differentiate yourself. Cause you to abandon this important media channel because you’ve concluded: ‘content marketing is a waste of time’ – because you aren’t getting the results you expected. Author’s Note: You can review the full report here: ‘B2B Content Marketing: 2013 Benchmarks, Budgets, and Trends–North America‘. (Also, I thought Patricia Redsicker’s summary of this report, 8 Content Marketing Trends for B2B was excellent as well). 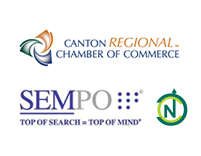 → Local SEO: Are Akron & Canton Businesses Ready?